With Thunderbolt 2 technology, the interface is no longer the performance bottleneck. For the 8big Rack, LaCie harnessed the breakthrough performance potential of the Thunderbolt 2 I/O, squeezing the absolute best speeds out of the hard disks. Add a hardware RAID controller and 7200 RPM disks, and the result is incredible, sustained speeds of up to 1330 MB/s that turbocharge 4K workflows, file transfers, or backups. With this kind of speed, videographers can work directly from RAW files in Apple® Final Cut Pro® or Adobe® Premiere®, get maximum quality from footage, and see edits in real time. No need to first convert footage into a lower resolution. Avid® Pro Tools® users will notice incredibly smooth audio mixing, even when working with hundreds of tracks simultaneously. Professional photography agencies and other Adobe Lightroom® or Apple Aperture® users can browse through archived libraries of thousands of RAW and edited images, with zero lag. 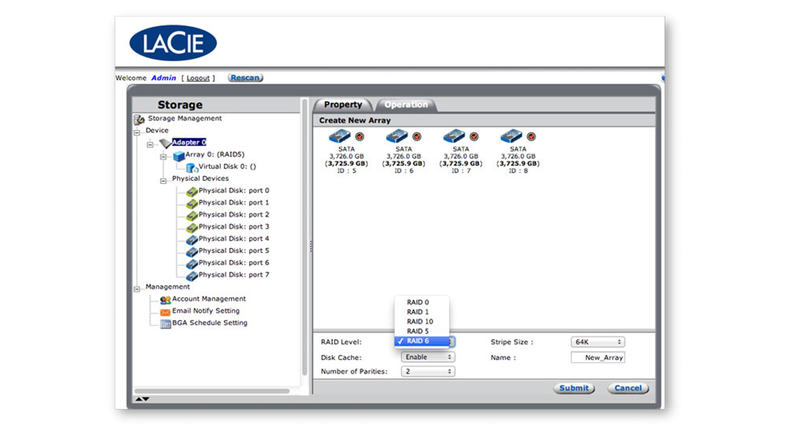 LaCie RAID Manager software gives you a centralized, powerful way to configure and monitor all the LaCie 8big Racks that are connected to a single workstation. From one application, you can control the RAID mode, system monitoring, and email alerts. Select RAID 0▲, 1 (two-disk configuration only), 5, 6, 10, or JBOD. RAID Manager even supports RAID migration, so you can move from RAID 5 on 4 disks to RAID 5 on 8 disks – without data loss. And system monitoring can alert you of problems or potential problems via desktop notifications or email, so you can address issues before they result in data loss. For the ultimate in peace of mind and value, the LaCie 8big Rack features a three-year limited warranty. It includes comprehensive, complimentary web-based resources, expert in-house technical support, and worldwide repair and/or replacement coverage. You can even upgrade this service with warranty extensions and fast product replacement.